Regina Public Schools has a set of attendance boundaries for elementary school, high school and French immersion programming. The boundaries are used to identify elementary schools and high schools and the neighbourhoods of Regina that they serve. 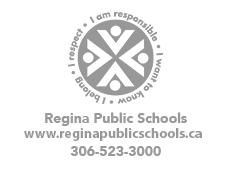 Please refer to the Administrative Procedure 310 for more information regarding attendance boundaries at Regina Public Schools. There is also a High School Strategy that took effect in September 2015. What school is closest to your home? Click the "find Schools near your home" icon and see! This link is also conveniently located under the "Schools" tab under "Locate a School." If there is a discrepancy, please speak to the principal in school closest to your home. If you wish to enrol your child in a school which is outside the attendance area, you must complete the School Enrolment Exemption Application Form. If you have any questions about registration, please ask the principal of your local school or contact Regina Public Schools by email or at 306.523.3000. If you have any questions about the school locator, please ask! Attendance boundaries are also used to identify nearest schools for transportation purposes. Please visit the transportation section for more information.